Ever since the 7.2-magnitude earthquake hit Haiti last January -leaving some 230,000 people dead and displacing 1.3 million more to tent cities-Haiti’s musicians have struggled harder than ever to find audiences. In addition to the immediate human suffering, the earthquake also put a long-term dent in Haiti’s fine arts culture, including its delicate jazz scene. 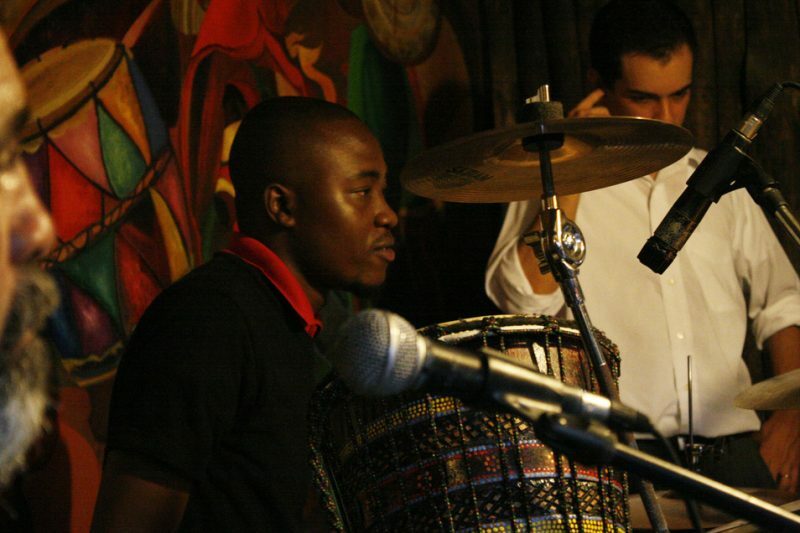 Before the earthquake of January 12th, jazz was a small but vibrant art in Haiti, with two dedicated jazz groups and a handful of bands that dabbled. Though its reach was usually limited to a handful of cafes and bars in the wealthier Petionville neighborhood above Port-Au-Prince, local jazz musicians began to introduce their craft to the masses through an annual international jazz festival and outdoor concerts in public parks. When Widmaier opened his own station in 1970-now Radio Metropol-his very first program was a jazz show called “Ten to Eleven,” which he continues to host to this day. Back then, Widmaier featured Haitian musicians by the names of Guy Durosier and Gerald Merceron, who had begun arranging and recording their own styles of jazz. At least, that’s what jazz sounded like in Haiti before 4:53pm on January 12th, 2010. Although most jazz musicians and enthusiasts here say the earthquake didn’t damage Haiti’s jazz scene in the long run, there’s no denying the challenges it created for Port-Au-Prince’s music culture. 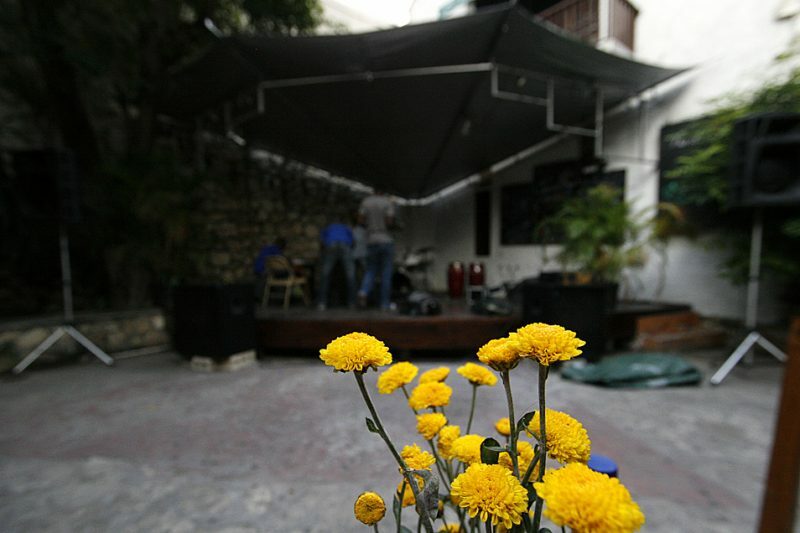 Cafes that used to host jazz and other Haitian music closed, and the owner of the up and coming jazz culture hangout Jazz’s was murdered in the aftermath. Even the parks that once hosted occasional public jazz concerts became immediately filled with the blue and grey tarps of tent cities. 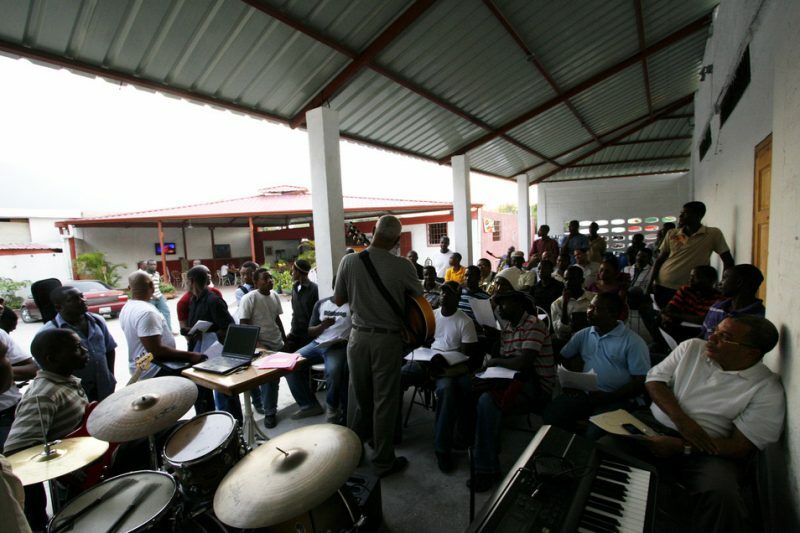 Most devastating to Haiti’s long term musical aspirations was the destruction of the St. Trinité music school, where many of Haiti’s jazz artists received their first formal musical education. Worse than the destruction of the building itself and numerous instruments inside, a number of young musicians who studied there were killed in the earthquake. It was into this scene that N.Y. pianist Aaron Goldberg arrived, five months after the earthquake. 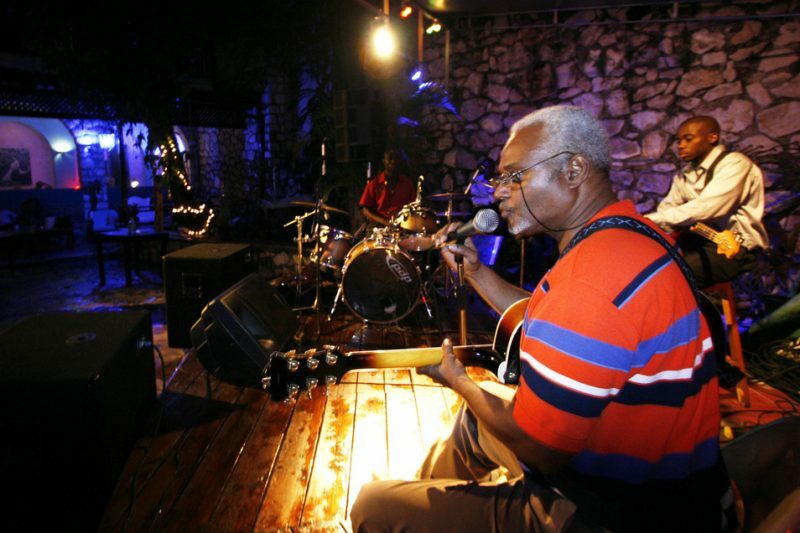 By no means an outsider, Goldberg has been involved in Haitian jazz ever since he stumbled upon Haiti’s international jazz festival while on a visit here in January 2009. Equally challenging is finding Haitians who want to embrace a music that seems neither native nor culturally comfortable. 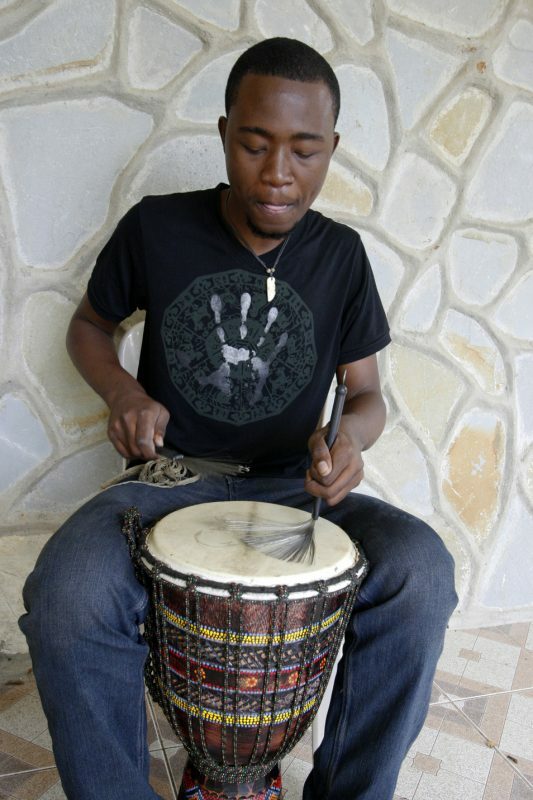 Throughout most of the country, Haitians listen to Konpas, with rhythms slower than meringue, and Mizik Rasin, a mix of African-influenced Vudu/roots sounds with rock n roll or reggae. Haiti’s few jazz musicians typically play American standards and Latin jazz. Sometimes they use traditional Haitian and African styles to mix their sounds. But most of these musicians are not so much jazz connoisseurs as members of reggae, rock or House/Vudu groups that learned a couple of jazz numbers on the side. Louis “Paluto” Patrick is a keyboard player in once such group. His band Voyage plays a mix of jazz, roots and reggae house music. 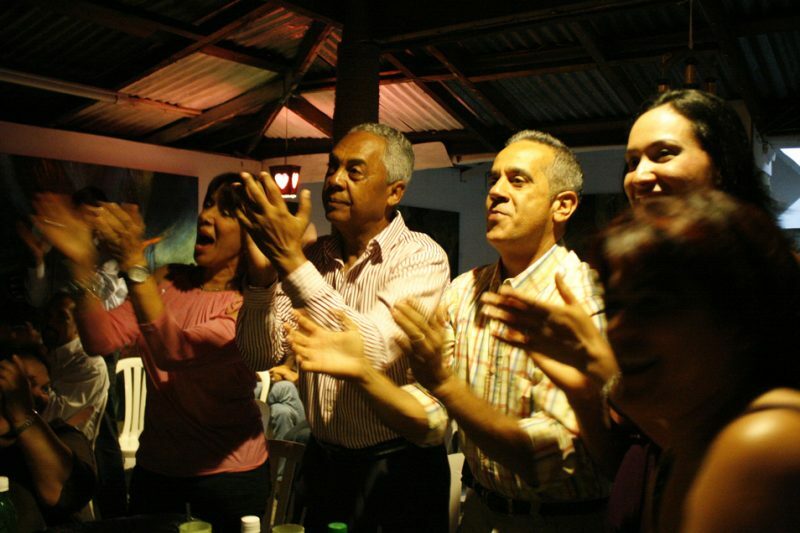 After hearing a performance by a jazz group a few years back, Paluto invited some friends to start a group to imitate that sound. “I found something special in jazz because they have a mistake thing, where the rhythm is very special,” Paluto said. For Calude Carre, getting past that confusion means continuing his work as a musical educator. Carre began studying jazz around 1995, attending a National Guitar Workshop in Connecticut, then returning to St. Louis two years later for a series of jazz-guitar seminars. He has performed internationally in Japan and Martinique, and although he’s never recorded a full album, his compositions are occasionally played on Radio Metropol and another Port-Au-Prince station. Carre estimates that he’s mentored around 100 students in his career, many of whom, like the drummer Johnbern Thomas, have gone on to perform internationally. 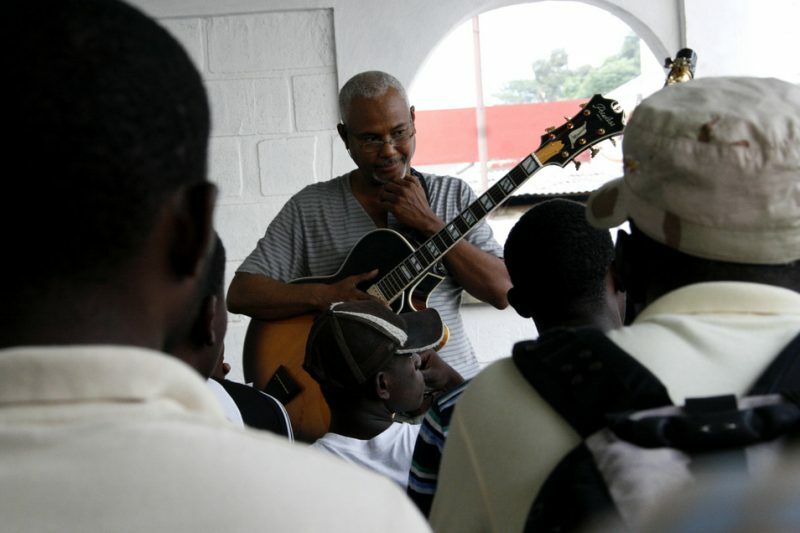 You wouldn’t know jazz in Port-au-Prince is struggling by the 50 or so music students who showed up to a free seminar Carre put on earlier this month. Musicians of all ages shot questions at Carre as he taught them jazz riffs, and some brought their instruments to improvise a bit with the nation’s go-to jazz instructor. The sight of that excited audience of music enthusiasts is hard to reconcile with the Sunday night scene at Café des Artes, watching Carre pack up his instruments in relative silence as the dwindling audience continues conversing over drinks. Haiti’s performing jazz scene has, for the time being, been reduced to Carre’s own trio at a single Café-and, as he laments, without a wind player. But as Port-Au-Prince’s venues and curious music students recover from the earthquake, and as Haiti’s International Jazz Festival makes a comeback next January, jazz is unlikely to remain buried in Haiti for long.